Today was cold and wet and rainy and I want my mommy. But PD and I had the most wonderful shrimp Alfredo for dinner. I’m sick of the campaign phone calls. Hank Williams Jr. called last night. Shouldn’t he be busy singing or something? So I go to bed last night. I slept for a few hours and woke up. I looked at the clock on the nightstand. The time seemed not to coincide with how much time I felt like I slept, so I reached under my pillow for my cell phone aka back-up alarm. There was an hour time difference. WTF. I knew that DST was coming but that it wasn’t happening last night. So I spent an undue amount of time analyzing which of the two times might be correct. And of course, being all awake like I get when I’m thinking too hard, I had a piss of a time getting back to sleep. Why the hell aren’t these appliances smarter??? So I’m going in to work now and hoping that I’m not an hour late. Or even worse, an hour early. This is how I spent my day. 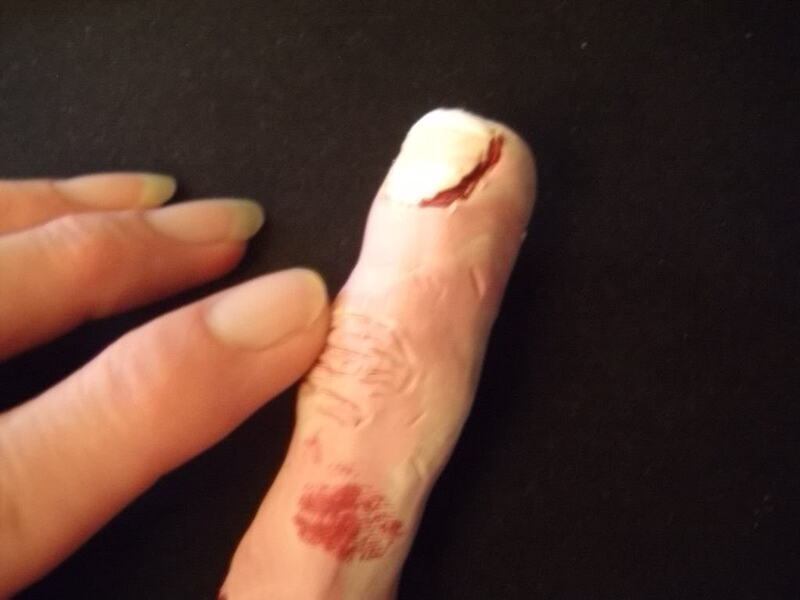 I dug out some clay and made this finger which PD wants to put in a jar. 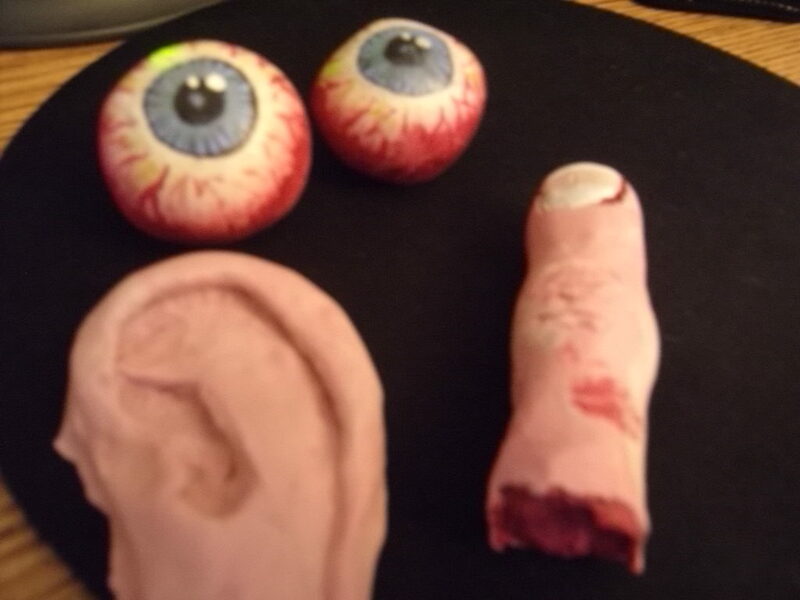 Then I made two eyeballs out of Sculpey and baked and painted them. 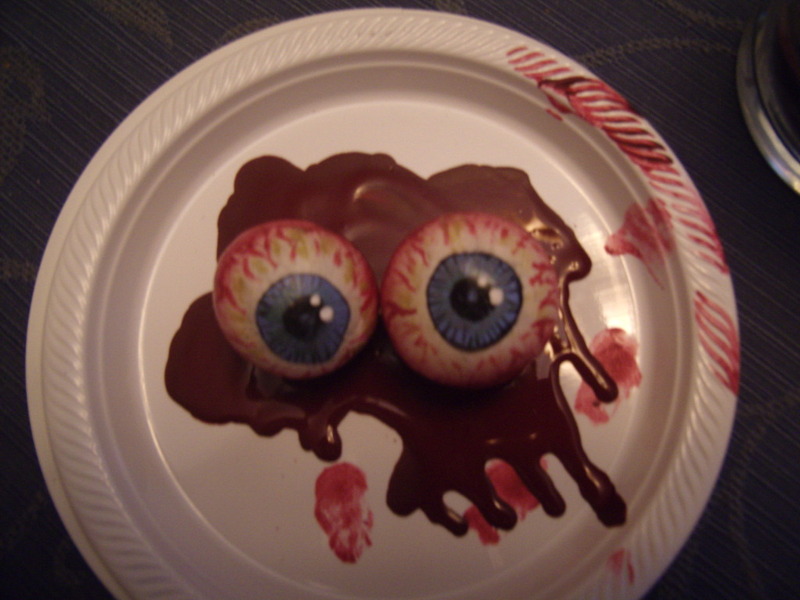 Then I put some paint on a plate to look like blood and when it dried, I glued the eyeballs to the plate. I made an ear out of clay too, but ears are really hard to make. You can tell. 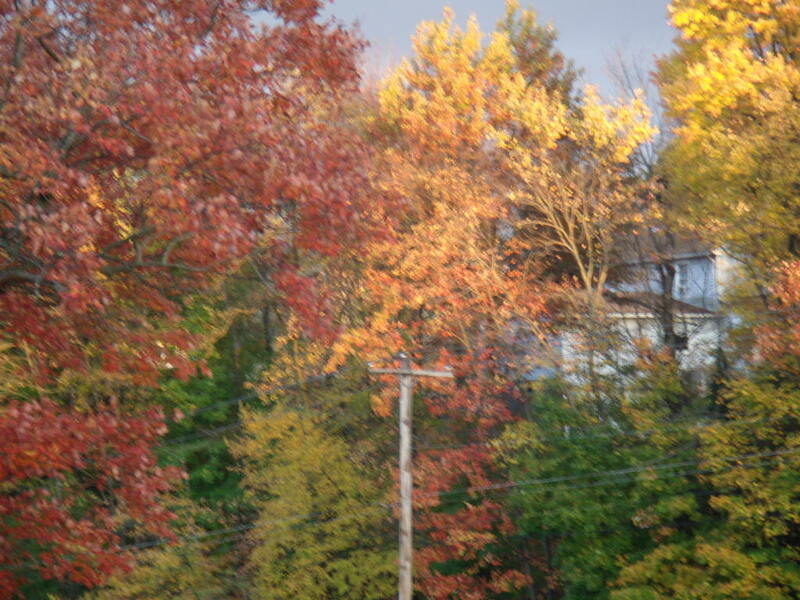 Then I saw that the sun was finally shining and I went outside and took a couple of pictures from my front porch. They’re blurry, but I was cold and shivering and the camera moved a lot. You’re probly wondering, “Why the body parts?” Well, PD is setting up what looks like an autopsy arena on our front porch. For Halloween. He’s been at it all day and I must say, I think he found his best talent. 😉 He’s frighteningly good at it. I painted some tombstones for him while I had breakfast this morning and then decided to be creative and did some sculpting. Was fun but now I have a big mess to clean up. I can’t seem to get in a good mood. I think I’m going to opt for a bubble bath and put my jammies on. Then I think I’ll make myself a drink and watch Juno again. Saturday sure went fast. Damn. Oh yeah, Piglet wanted to see my new glasses. Here they be. Actually I’m listening to all 4 Kings of Leon cds over and over and these others intermittently in between. I just discovered Leona Naess and she’s really great. She’s been recording for quite awhile, not sure how she got by me. I got the new TV on the Radio that just came out, Dear Science. I’m not liking it as much as Return to Cookie Mountain, but they’re a great band. The Longer I Run, I just stumbled across on iTunes and really liked the song, it seemed to suit my mood lately. I’m not familiar with Peter Bradley Adams but I may just check him out. I’ve been listening to MGMT for ages and I’m happy to see that they’re finally getting their due. I was surprised and glad to see them on the cover of my November Spin. KaiserCartel, I know nothing about, I just heard the song and liked it alot. Jolie Holland, I just always loved her voice and Mexico City is on her newest album, Catalpa. I don’t know how I ever got so lucky to have the friends that I do. I swear. In my everyday life, I’ve been blessed many times over. And in the past couple of years, I’ve not been a very good friend to those I cherish. I haven’t made the time to pick up the phone and set up lunch dates or even just take the time to get together to catch up on news. At the end of the day, I’m tired or busy. I rush home to get away from all the crazies and take refuge in my wonderful house where I call the shots and shut out the bad noise. Sometimes I even let PD call the shots. But I feel safe at home and it’s where my “stuff” is that makes me calm and the only demands I’m facing are the pile of dirty laundry, a heap of unread mail or the dust on the hutch. Unscary stuff. Stuff that I can tackle when it suits me and I know I can do a good job and not be judged or watched over my shoulder. I do it my way, not to suit someone else’s specifications. I have lately come to appreciate the difference in the way I feel once I step over the threshold into my and PD’s house. It’s like feeling someone wrap big, strong arms around me when I need a hug. Gawd, where did that come from? (My new favorite expression. Thanks, Maddie) I started out talking about how I’ve been blessed with friends. Back to that… Anyway. I love to come home at the end of a work day. 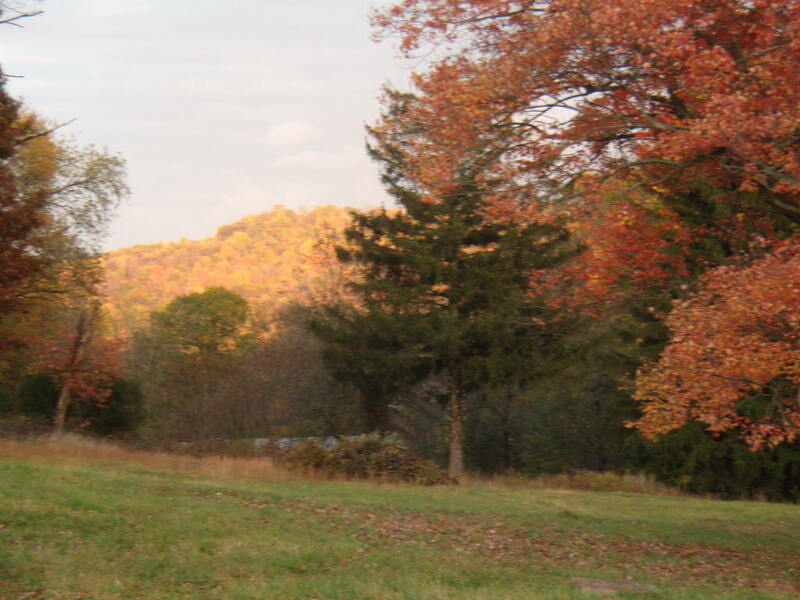 And at the end of the work week, it’s even more inviting. And if I have to leave, it better be for a pretty good reason. I’m turning into a freakin’ hermit, aren’t I??? Well, it’s like this… It’s scary out there. There are mean people driving on the road, pushing shopping carts in the grocery store, behind the window at the bank, at the gas pump next to me, across the room in the restaurant, all over the place. Who wants to deal with them? Ok, I need to wrap this up and go to bed so I better get to what I was planning to say In The First Place. I’ve been trying to keep my mind occupied lately, mostly because there is so much going on that bothers me in the world that makes me feel helpless. Rather than fret and worry and wind up with a headache and anxiety which have been plaguing me lately, I’ve chosen to fill my mind with calmer thoughts. Or at the very least, things that don’t require a Tums or a Xanax before it’s all thought through. Something that puzzles me… Salt has become a big NoNo in so many of our diets. Or sodium, whichever. It’s a natural substance, as is sugar. There are umpteen sugar substitutes on the market, designed to be lower in calories or better for you. Granted, some of those sugar substitutes are more like poison than sugar… My question is this… why hasn’t there been a salt/sodium substitute created that is less likely to affect high blood pressure? Me, I don’t use salt routinely, nor do we cook with it. I seem to crave salt now and then and those are the only times that I use it, figuring that my body must need it if I’m craving it. Same goes for chocolate and nicotine. That was supposed to be funny. But seriously, why no substitutes for salt? I know there is Sea Salt on the market and we’ve looked into it as PD’s diet is way way low sodium but there doesn’t seem to be much less sodium in it than in regular table salt. I haven’t researched this before asking, but I’m thinking that if there is a sodium substitute out there that’s better for you, we would have heard about it. 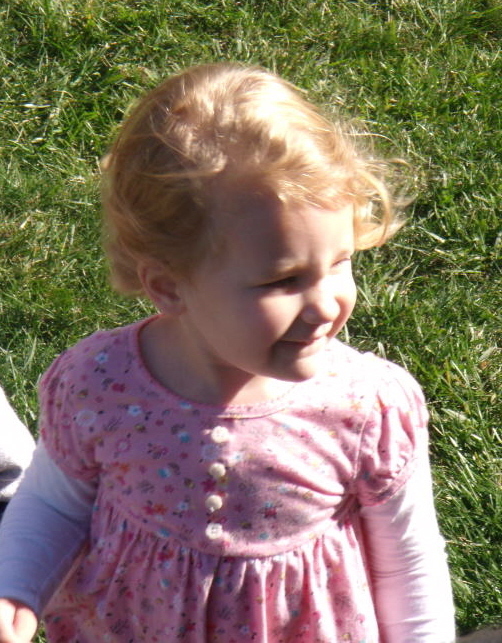 You can see more of Maddie and Andrew and Julian in my Flickr pics later. I’ll let you know when they’re up. I’ll answer comments when time permits. Hopefully soon. Watch Leno tonight, Kings of Leon are supposed to be on. Enjoy it for me. Thx. If this were the kind of blog and I were the type of person to address current events, there would be a bunch of crap here about The Debate and The Bail-out and that sort of thing. But it’s not and I’m not so let’s talk about something else, shall we? I never finished the posting about the end of The Airborne Toxic Event show. I’ll try to put it in a nutshell. Not sure if I said this or not but I’m not a fan of The Fratelli’s, which was the headlining band. But Michael and I stayed and gave them a fair listen. I did particularly like one of their songs (the title escapes me) and 2 or 3 others were good. Just about near the end of their set, I saw Daren, TATE’s drummer walking toward me and crooked my finger at him and he got a big smile and came over. I was sitting on a step leading up to the sound booth and he told me not to get up (he’s kind to old ladies) and leaned down and said “So how did we do? You know, compared to…?” (I assumed he meant the Fratelli’s) I said something like “They paled in comparison to you guys!” and he seemed happy to hear that. From what I remember of our conversation, I told him that I hope their iminent fame wasn’t going to affect them in a bad way or something to that effect. He said, “You know, I think about that a lot.” And I forget what else he said after that, dammit. I do, however remember vividly what he said about how awesome it is to go to a strange town where most people never heard of the band and be so well-accepted. I told him it was because the band is so approachable and friendly to their fans. He told me how important “connecting” is to them (the band). Whether it be on a musical level, a lyrical level or even a spiritual level, he said, there is just nothing like reaching out and connecting with virtual strangers and have them accept you. I agreed that it must be an incredible feeling. We talked a little longer and I told him again how great the show was and that I wished them a very successful tour and safe travels. I stood up and hugged him kind of hard and he hugged back just as hard. It was a “moment.” 😉 So that was that for the night. I think. I’m sure I left out some details but it seems so long ago now. Although I still listen to them every day at least once because, dammit, they have some damn good music. I read last week that they had to cut a few stops off their tour due to the Fratelli’s suffering a bereavement. Something completely unrelated. 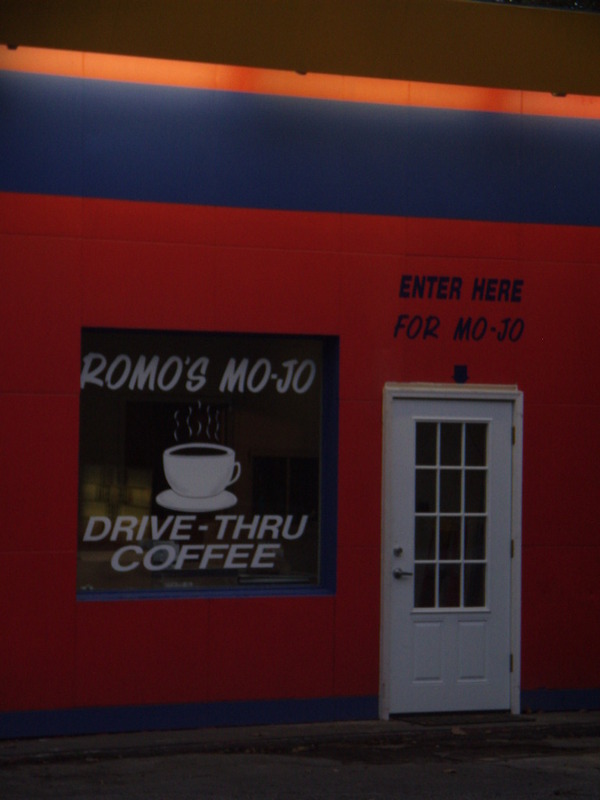 The Drive Thru Mo-Jo pic I posted? I took that a couple of weeks ago and just never got it out of the camera until the day I posted it. Today on my way home from work, I saw some construction going on there that looks suspiciously like the framing for a drive-up window. 🙂 So I’m excited again. I hope it’s at least as good as Dunkin’ Donuts’ coffee. In that case I will be taking advantage of being a lazy Yank and not having to get out of my car to get coffee in the am. Right, BD? Riiiiiight. Going to New York this weekend and I’m rilly, rilly looking forward to it. Ju said Madeline has a cold so we won’t be doing a whole lot of smoochin’ but we’ll still have fun. I’m anxious to see how big Andrew has gotten (hopefully not real big) and see what he’s been learning. He’s going to be two next month already. Julian reminded me on the phone last night that we have to play “What Nana Says” which is a game we made up where he has to do what I say, normally something goofy but with some sort of lesson. I have to think up some new ones for him. Suggestions welcome. The router finally came, so soon as PD finds time to hook it up, I’ll be able to use my laptop again. I’m thrilled about that because I hatehatehate the keyboard on this PC. I’m down to 13 cigarettes a day this week. Still down two pounds. Question for y’all. What’s your favorite way to spend a rainy dark Fall night? I got kind of excited when this establishment (aka car garage) down the hill from me advertised a Drive-Thru Coffee feature. Not quite so excited about it now.